In the spring of 1998, guitarist Jeff Fuccillo (Irving Klaw Trio, Wham-O, Hochenkeit) met avant-folk guru John Fahey while opening for his trio at a gig in Portland, Oregon. Fahey was sufficiently impressed, and booked studio time to record Fuccillo for his label. On the day of the session, Fuccillo arrived prepared to make a solo acoustic guitar album. To his surprise, Fahey had brought along a pile of samples — random snatches of music, all manner of sound effects — and without warning, began shooting them out into the studio room through the monitors, effecting a guerrilla collaboration of sorts. 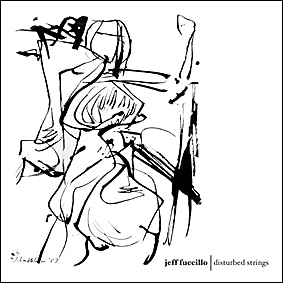 Disturbed Strings captures the highlights of that day: veering from hardscrabble stringrattling to modal melodicism, the album is ample testament to Fuccillo’s wide-ranging inventiveness as an improvising guitarist, as well as a window into an aspect of Fahey’s artistry not previously represented on record. Released in an edition of 542 copies, with artwork by Fahey and Judith Lindbloom.